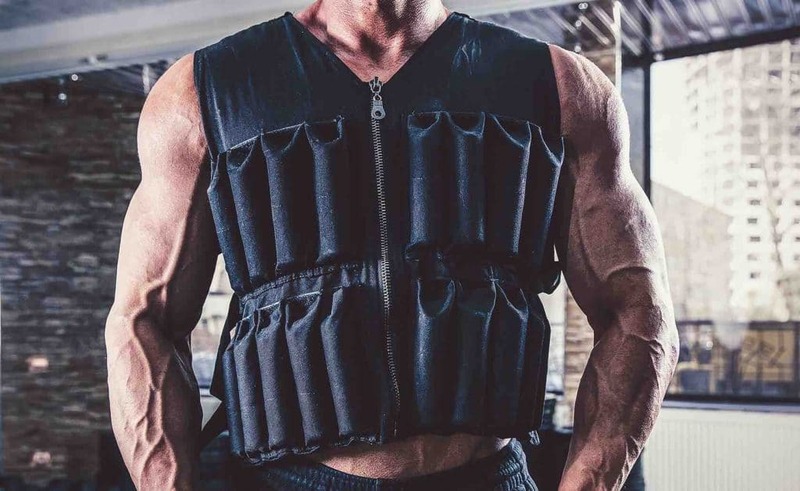 In this article, we will review the best weighted vests on the market today. There are many types of weighted clothing out there, but weight vests are by far the most versatile and popular. Weighted vests evenly distribute added weight around the torso/chest area, making them effective tools for a wide range of fitness purposes. Adjustable weight vests come with lots of pouches into which you can add or remove your weights. Vest too heavy? Open up a few of the pouches and remove the weights. Getting stronger? Add add more weights to your weighted vest. If you do solid research on the best weighted vests for you needs, you should only need to buy one, ever! One weighted vest can last you a fitness lifetime, so to help you make the best choice, we’ve put together a list of the best weight vests on the market today. 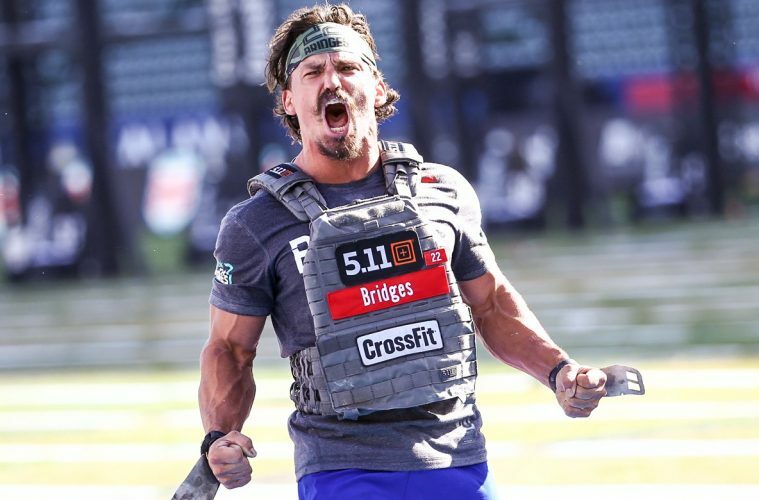 What is the Best Weighted Vest For The Money? Why Are Weighted Vests Effective? The CAP Barbell Adjustable Weighted Vest is our #1 best weighted vest on the market today, hands down. 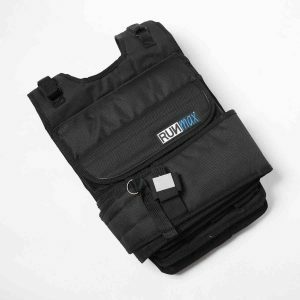 This adjustable weighted vest comes with sand bags that that are easy to add or remove from the adjustable pockets. When ordering, you can choose the amount of weight that is right for you (ranges from 40 lbs to 150 lbs). If you already have weights, you can add those to the vest with ease. The CAP Barbell Adjustable Weighted Vest comes with a one-size-fits-all belt to accommodate wearers of all shapes and sizes. As an added bonus, this vest has nicely padded shoulder straps to ensure you’re comfortable. A velcro strap across the front ensures a snug fit. CAP Barbell has a sterling reputation in fitness and exercise equipment, and their company is known for making durable, high quality gear. CAP Barbell’s stitching and attention to detail make this a reliable, rugged, no-frills choice for any fitness enthusiast. This vest is a little more expensive than others on our list, but as we mentioned in the introduction, if you invest in the best weighted vest, you’ll never need to buy another! This is truly the best weighted vest money can buy. The Tone Fitness Weighted Vest (12 lbs) is the best weighted vest for people who don’t plan to add or remove vest weights in the future. At 12 lbs, the Tone Fitness Weighted Vest may not be able to carry a lot of weight, but it makes up for it by being comfortable, non-obstructive, and well-made. This weight vest is extremely popular among women whose fitness regimens revolve around walking/running, cross-fit training, or HIIT. As a larger 6’2″ guy, wearing this weighted vest felt akin to a small backpack, so it can work for men looking for a small resistance boost. The Tone Fitness Weight Vest is relatively inexpensive. 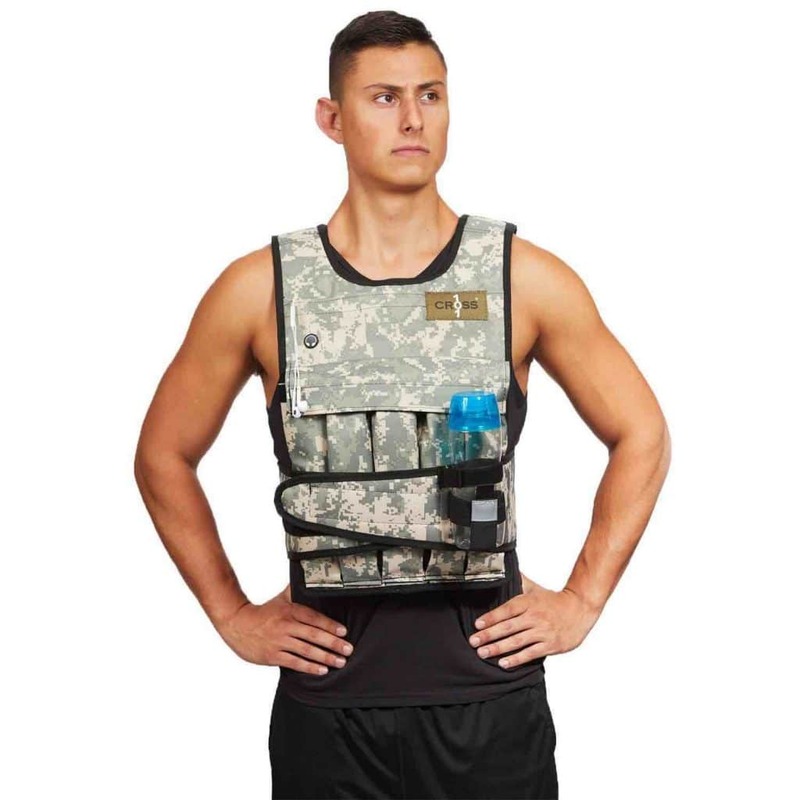 At the time of writing, this weighted vest costs under $50. It’s a sleek, easy-to-use, comfortable vest made of soft neoprene fabric, and even has a pocket for holding your cell phone (though I wasn’t able to fit my 5.5″ phone in it). At this price point, you can’t really go wrong buying this weighted vest! 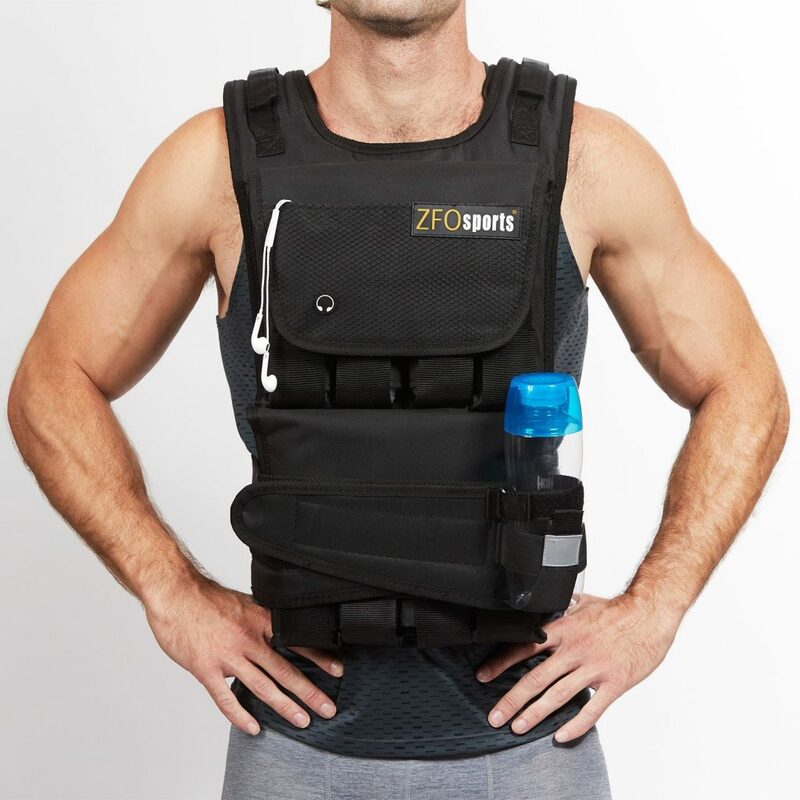 The ZFOsports 40 LB Adjustable Weighted Vest is a unisex adjustable vest with a lot of cool features. If you’re looking for a reliable vest that will fit snugly during the most intense workouts, this ZFOsports vest fits the bill. This adjustable weighted vest features custom molded fitting technology to ensure that the vest contours cleanly around the wearer’s torso. A velcro belt sits along the waistline to further support a close fit. There are a few notable bonus features on this vest. 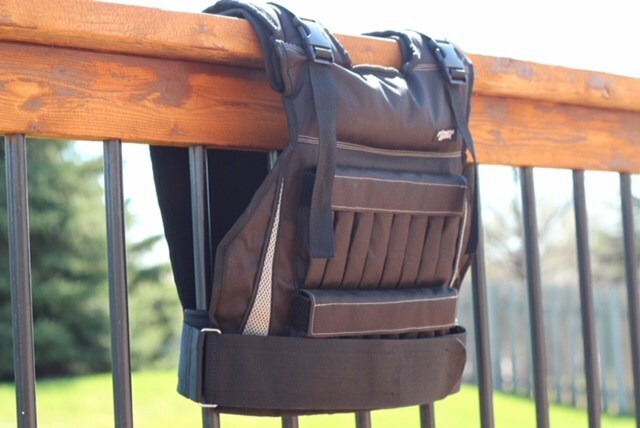 First, this is one of the only weight vests that includes a water bottle holder. Second, it has a phone holder that actually fits my huge 5.5″ pixel! Finally, this vest is fully adjustable and will suit any fitness enthusiast who wants to adjust the weight totals. The RUNFast/Max Adjustable Weighted Vest is the best weighted vest for big and tall guys. 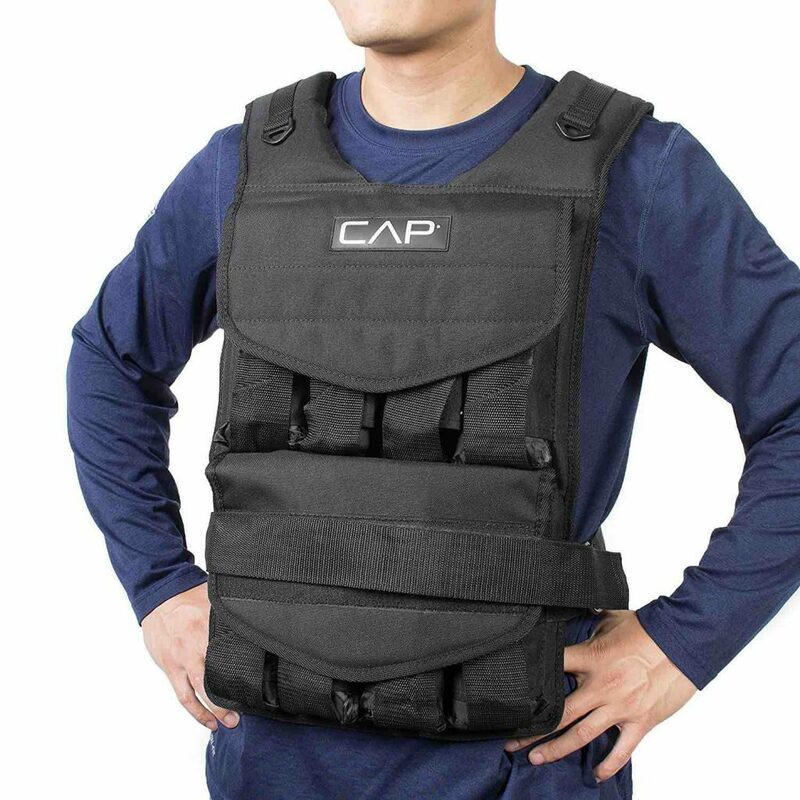 This vest comes in a range of weights, from 12 lbs up to 140 lbs. Please note that if you buy one of the <80 lbs models, its max weight will be 80 lbs. If you choose a >100 lbs model, then it will carry up to 140 lbs. This vest works best for men 5’8″+, 180 lbs+, and can be comfortably worn by guys who wear a size XXXL! 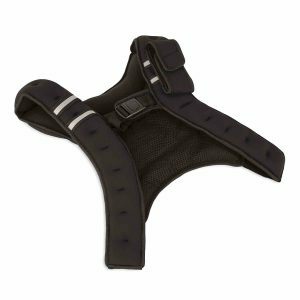 When ordering the RUNFast/Max Adjustable Weight Vest, you can opt in to shoulder pads. If you’re going to be wearing this vest with 60 lbs of weight or more, we highly recommend going with the shoulder pads version. Otherwise, you may have some discomfort during your workout. The Cross 101 Adjustable Weighted Vest is one of the most compact 40 lb adjustable vests out there. This vest is 15″ long and 13″ wide when laid flat on the ground, and comes with 40 lbs of iron weights included. Its max weight is 40 lbs, and you can freely remove or add more weights as you please. We also love that it comes in camo! One popular complaint with this vest is that there’s a little too much friction when jogging or running. I tested this vest on a 2 mile jog, and can confirm that there’s some uncomfortable rubbing around the neck and shoulder blades. That said, this weighted vest was perfect for activities like pull-ups and sit-ups. 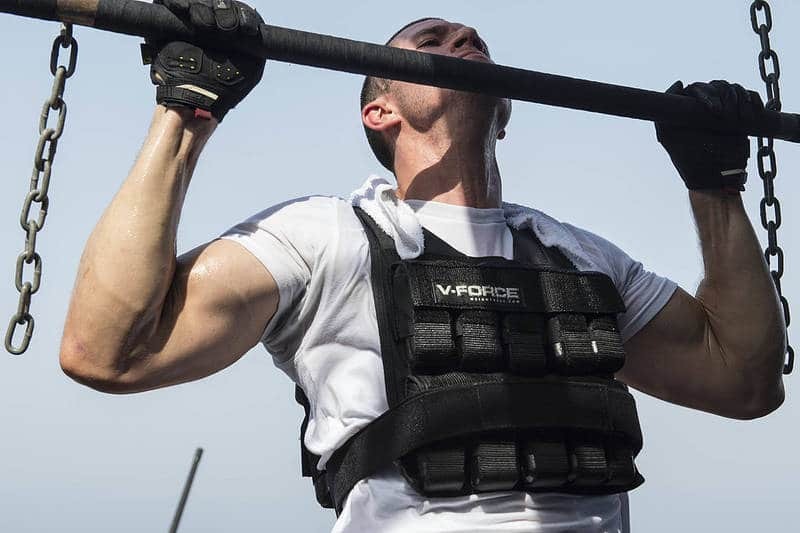 Weighted vests, originally pioneered by Lt. Michael Murphy, have three primary use cases: strength, fat loss, and therapy. Weighted clothes work because they force the body to work harder than it can on its own. Athletes who have hit a plateau have been able to use weight vests to force their body to perform at a higher level. Even a simple exercise like walking with a weighted vest will increase metabolic rates and leg strength. Studies have shown that everything from walking to running to simply doing chores while wearing a training vest led to significant increases in endurance, lung capacity, and strength. This translated to a more efficient body that could perform more difficult tasks with ease. 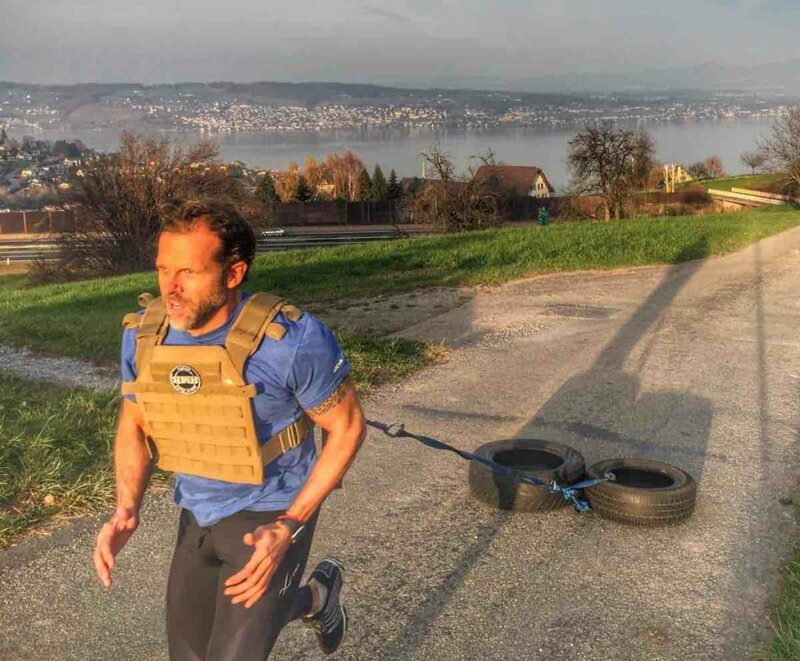 Weighted Vests Build Strength. Weighted vests are extremely effective for improving one’s muscular or skeletal strength. Wearing equipment like a weighted vest can actually improve your bone density, not to mention improve muscle strength. By training your body under artificially “heavy” conditions, you trick your muscles – they’ll rush to accommodate the added weight. That means strength gains for you! Weighted Training Vests Promote Fat Loss. Weighd vests are a solid fat loss tool, and it’s easy to imagine why. Take the example of cardiovascular exercise, like jogging. Weighted vests, ankle weights, or shoe weights force the runner’s body to work harder and burn more calories. Because your body is carrying a heavier load, it has to work harder, resulting in additional calorie burn. Weight Vests Can Be Therapeutic. A vest with weight on it can be used for more than health and fitness purposes; they are effective for soothing children and adults who struggle with Autism, Asperger’s, ADHD, and other behavioral problems. This is a much more specialized use case, but a very important one nonetheless. There are also weighted vests for animals that have a similar calming purpose. There are three major considerations when it comes to choosing the weighted vests: comfort, material, and style. Comfortable Fit: You want your vest to be comfortable so that you don’t hate wearing it! Do NOT choose a weighted vest that has narrow shoulder straps. A vest with narrow straps does not distribute weight efficiently across your shoulders. As a result, when you increase your weight, those straps will hurt a lot and dig into your shoulders. No one wants to come home after a workout to find that their vest left two raw red stripes on your skin. Weight vests have a broader top-of-shoulder construction to evenly distribute the weight across your upper body. Vest Material: Hands down, the top weight vests are breathable and do not retain moisture. Imagine exercising and wearing a garbage bag on your torso; that’s what non-breathable weighted vests are like. If you don’t choose a breathable weight vest, you’ll get too hot and clammy during exercise. We highly recommend ordering your weighted vests on Amazon because they have a free return policy. Test a bunch of vests and return the ones you don’t like. It’s risk-free and helps ensure you choose the right one. Style: Are you going to wear the weight vest only for workouts, or are you looking for something you can wear during everyday life? If you’re looking to build strength throughout the day, while going to class, etc., you need a sleek, slim weighted vest that will fit comfortably under your clothes. If you’re only planning to use the vest when you go to the gym or work out at home, you don’t need something slim and fashionable. Your usage patterns will determine the best weighted vest for you. You might also consider a weighted shirt for everyday use. 1. Walking With Your Weighted Vest. 2. Running In Your Weighted Vest. If you are an accomplished runner, then you can immediately begin running with a weighted training vest or other clothing items. Begin running short distances at first and then go as you feel comfortable. Weighted vests are great for runners because it will increase their lung capacity, a huge benefit no matter what distance you may run. 3. Wear a Weighted Vest To Go Biking. Cycling while wearing a weighted vest can take a normally easy workout into “pretty tough” category very quickly. It is best to wear a vest when biking because something like ankle weights will change with your center of gravity and throw off your balance. You also get the added benefit of strength training as you must work harder to come up and out of the saddle while you bike. 4. Bodyweight Exercises (ie Pullups) With a Weighted Vest. After a certain point, simple bodyweight exercises will no longer help you become stronger. Instead of investing in a dumbbell set or joining a gym, you can simply don weighted gear and do your normal workouts. You will find that moves you can normally do with ease will be much more difficult. Most weighted vests allow you to adjust the weight of the garment, so you can increase the intensity of your workouts as you progress. Do pullups in your weighted vest! 5. Lifting In a Weighted Vest. If you prefer to lift weights, adding in a weight vest can help you increase your load without causing any harm to the body parts you are not working. For example, a weighted vest can help you deadlift more without hurting your grip. Weighted vests will also force the muscles under the clothes to work even more. So, if you want to increase leg strength, then consider using weighted leg wraps while doing leg lifts. 6. Everyday Chores in your Weight Vest. If you think you are not ready to workout with weighted clothes, you can wear them while doing normal, everyday chores. This will force your body to burn more calories doing activities you would be doing anyway. It might make doing the dishes and taking the trash out a bit more tolerable. Fit is super important, so try a lot of different brands and materials until you find your perfect match. You should always buy an adjustable item over a non-adjustable item; adjustable means that as you increase your strength, you won’t have to buy new equipment! Always take safety precautions and consult a physician or trainer when kicking off a new training regimen. Thanks for the great post. I’m definitely going to get a weighted vest, but my budget is pretty low — $50 to be exact. What are my options?